We live in an immensely narcissistic time. Social media has its pluses, funny jokes and sharing the joys of family/friends among them. Increasingly, however, it’s becoming a sad forum for “ME. ME. ME.” I don’t necessarily mean that in the sense of “look how great I am” but instead “look at how awful my life is.” FML is a current acronym; I won’t spell that out here. Remember, narcissism can be deprecation as much as braggadocio. When you’re in a dark place in life, one of the worst things you can do – and which will almost inevitably result in extending the duration of that dark place – is to sit idle, believe you’re alone, and complain about it. Duncan, man up! This feces show you call your life is not about you, especially when you’re a husband and father. I’m sure your kids will be tickled to see their dad call the active decision to bring them into the world “not obviously a good choice.” What sort of person says he’d reconsider being a dad? And if you’re a parent and have never heard another parent complain about how exhausting it is, you are too cloistered to have an opinion. 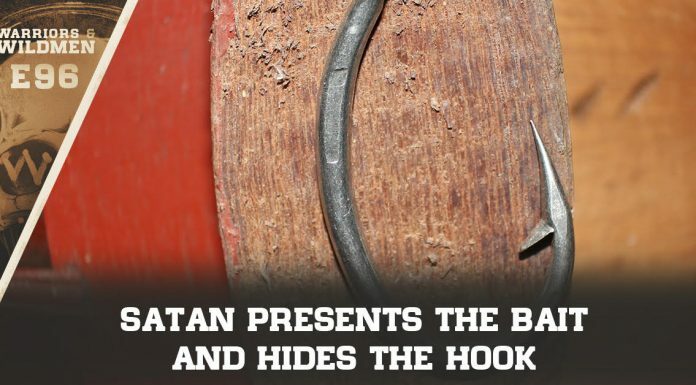 By the way, you don’t have to be a parent to know this. Look around you. There are millions of people who look like they’d give up a vital organ for 21 more minutes of sleep. I don’t mean every night, just one session of 21 minutes. 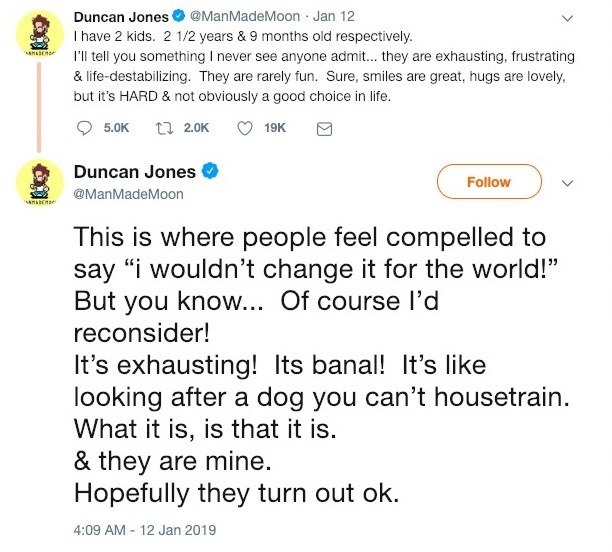 By the way, Duncan, you’re a Hollywood movie director; how involved with your children are you, anyway? What’s more sad is this screed earned nearly 20,000 Likes. It’s possible this ungrateful putz was just being funny, but I doubt it. Another point: How many couples would gladly give everything they have to raise the children he clearly despises? We’ve become so coddled and entitled in the 21st century that hardships are not expected. When they come, as so often they do and without warning, so few of us are prepared not just to handle them, but actually let the difficulty upgrade us. 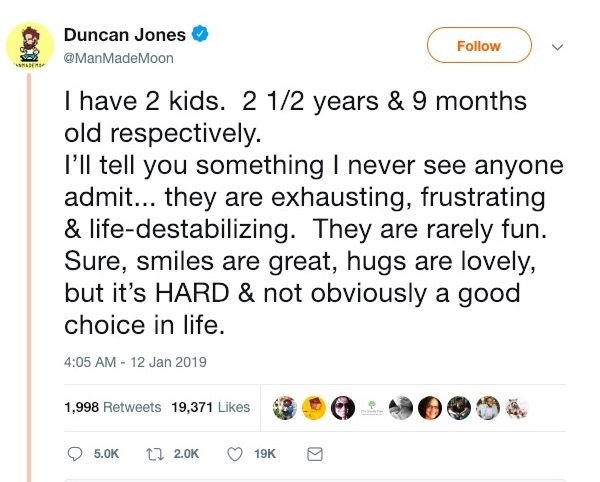 Being a parent is a lot of what Duncan Jones says, but Mrs. Cummings and I love it and would not give it up for anything.